2. Rent a copy of Laurie Anderson’s Home of the Brave . 3. Cover a toothpaste carton in black paper and stand it on the television set next to a photo of Alice Cooper. 4 (Optional). Make hand puppets (12) out of old socks or scraps of felt, or buy some authentic Balinese shadow puppets on eBay. 5. Put the CD in the stereo, the tape in the VCR, mute the television, and enjoy! 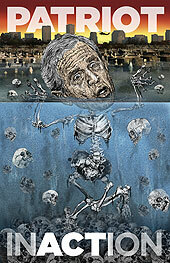 A fantastic new poster by Robbie Conal has started to appear in the city — George W. Bush’s skeletonized body floating in the sepulchral floodwaters of New Orleans. I live in Los Angeles. Lately I’ve noticed a couple of billboards directing me to www.JayTheWriter.com. The billboards have black text on a white background, one I’m thinking of in particular says, “Hey Kevin Costner, I wrote ___ ____ just for you.” But the word “Costner” is crossed out, and “Kline” handwritten above it, so it now reads: “Hey Kevin Costner Kline, I wrote ___ ____ just for you.” As the weeks go by, the name is crossed out again and again, replacing “Kline” with “Spacey”, and now “Bacon”. Sadly, JayTheWriter is actually just another vanilla writer with a bunch of boffo screenplays. He’s got a drama, an action thriller, a farce comedy, and a sitcom. Bleh. One thing JayTheWriter does have is a clever touch for marketing. So here’s some free publicity for you, Jay. Good luck and all that.